So I’ve come to the conclusion that my TM rudder pedals are absolute crap. (Shocker I know.) I received them as a “bonus” when I originally purchased my TM Warthog HOTAS package and at first given the amount of time I thought I’d be spending flying aircraft vs. racing cars in Iracing I thought they were just fine. However, a year later with very little use the slide action of the pedals from left to right is akin to rubbing your skin with sandpaper and a few weeks ago I lost use of the right toe brake function which makes for some interesting landings. The problem is, I would LOVE a set of Crosswinds, but my wallet tells me that those are not an option unfortunately and unless I’m thinking I’m going to spend the majority of my gaming time flying vs racing it’s probably a bit of overkill. So that leaves me with items that may be a little more wallet friendly like the CH Products pedals or the Saitek pedals. Can anyone provide me with any advice regarding either? CH Pro Pedals are ok, and they will last forever. Having said that, the Crosswinds are massively better in comparison. My advice would be to stick with what you have a little longer and save for the Crosswinds. Note the difference in width. The CH Pro Pedals feel very narrow by comparison, and this is with me using the optional spacing attachment to reduce the width of the Crosswinds. After VR the crosswinds are the single greatest sim purchase yet. Its been said that the pawn is the soul of chess. Well, in a similar way the rudder is the soul of flight. It is the only indespensable control (in any plane worth flying imo anyway). I have saitek pro flight rudders. They must be over ten years old. I have dropped them, bashed them and mashed them with my tree trunk legs. After all this time and abuse, there is no spiking in any axis. It is breaking now from the drops (plastic housing and some guide vanes inside) but the sensors are all running flawlessly and i am still using them and can see me using them for some time. Honestly, best bang for your buck. Good feet spacing (to me that is important unlike some pedals). Even though it has lasted ever so well, it is plastic construction. Take from that as you will. Maybe they wouldn’t be breaking now if metal. The one thing about Saitek that has me concerned is that my perception is that their products were better 10 plus years ago than they are now. Maybe that’s completely false however. is definitely the case with sticks I believe. Unfortunately I can’t tell you about new Saitek pedals as I obviously don’t have a newer version. Mine are the old style with solid foot mounts. Sorry but I destroyed not just one but TWO Saitek Pros (well, actually my nephew destroyed the second set.) Was I too rough? I never thought so but given the result, maybe. Well there you have it. maybe stay clear of Saitek then ? See it as a donation to a dedicated sim fellow and denial of big manufacturers selling overpriced toy crap. Not in anyway trying to start anything (Crosswinds look like a very nice piece of kit). But I can buy almost 3 Saitek pro flight rudders to one MFG crosswind. What is the warranty of the Crosswind? I wouldn’t say that. Let’s not forget that the Crosswinds are at least twice as expensive. And I have had the most sad and comical nerd-journey when it comes to controllers. This is either an extraordinary coincidence or I had some role to play in at least a few of the failures. It also depends on the game. DCS doesn’t require a lot of quick input. But it does require precision. For years I played Rise of Flight exclusively and only under the stress of online play. That sim required more quick, full deflection inputs and this fact more than anything may explain the rudder failures. I know one thing. You don’t need to spend a fortune on eastern European boutique hardware. But you do need to spend half a fortune on midlevel stuff (Warthog, Saitek Pro) because the cheap stuff will need to be replaced every 6 months to 2 years and will cost more in the long run. Plus, before outright failure comes months of time and frustration spent “making it work”. (Ugg! Just the memory is a nightmare.) I guess if one happens to be a Buffalo in a china shop like me, he’s better off emptying his bank account now to save money, TIME and frustration later. 2 years warranty according to their website. Maybe I phrased it a little bit rude. I’d rather pay more to someone dedicated towards quality than to someone who does not care whether their products actually are useful. Every hardware developer has to make compromises to balance cost vs quality (well, maybe @Troll does not have to), but putting in cheap parts that a bound to break just to save 5 to 10 bucks per unit in production cost is the wrong way in my opinion. I only have experience with the crappy pedals from my G940. I returned the first set after the potentiometers where jiddering, rendering the unit dead on arrival. The replacement had the same issue and I gave up. I have no experience in regards to Saitek pedal. So your results may vary and I haven’t done a complete market research. I’m glad you point out that not all is lost when it comes to big manufacturers. What is the warranty of the Crosswind? I can tell you that one set of Crosswind pedals will outlast 10 pieces of that plastic schmonz Saitek sells. Plus they have way higher resolution, are way more linear, have less friction and you can customize pedal force as well as the force curve independently. 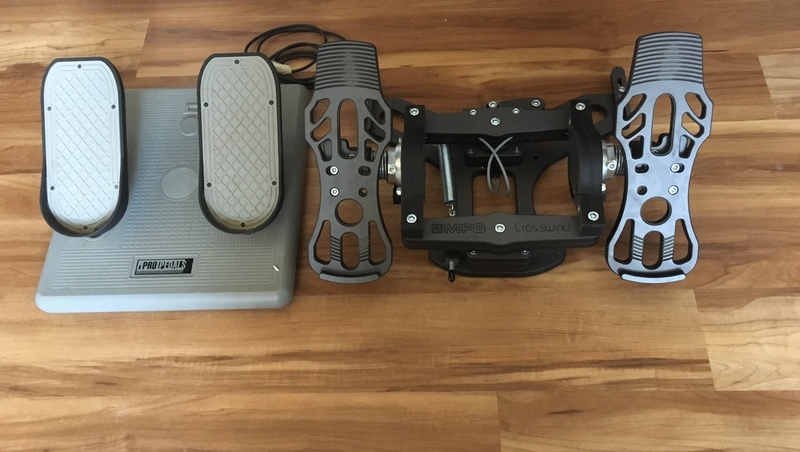 Crosswind pedals will outlast 10 pieces of that plastic schmonz Saitek sells. I don’t think this thread was meant to say the MFG’s were not worth the cost as I have always thought my Warthog stick/throttle combo along with my HE Pro pedal set and OSW wheel setup for racing have been so. It was really more of a question of if one were NOT to get something like the MFG’s (for whatever reason that may be), are there better alternatives to the TM pedal set for roughly the same cost? Didn’t know if many folks here had jumped between these cheaper sets a time or two and had preferences between them. I can say this definatively: Don’t get the Thrustmaster T-Flight pedals. I went through two sets courtessy of TM. Jittery and spikey (and a bunch of other made-up adjectives). Truly horrible! … shouldn’t that be media?